Statistics Canada ("the agency") is a member of the Innovation, Science and Economic Development portfolio. More information on Statistics Canada's mandate, roles, responsibilities and programs can be found in the 2018-2019 Main Estimates and in the Statistics Canada 2018-2019 Departmental Plan. Statistics Canada has the authority to collect and spend revenue from other federal government departments and agencies, as well as from external clients, for statistical services and products. This quarterly report has been prepared by management using an expenditure basis of accounting. The accompanying Statement of Authorities includes the agency's spending authorities granted by Parliament and those used by the agency consistent with the Main Estimates for the 2018-2019 fiscal year. This quarterly report has been prepared using a special purpose financial reporting framework designed to meet financial information needs with respect to the use of spending authorities. The agency uses the full accrual method of accounting to prepare and present its annual departmental financial statements that are part of the departmental results reporting process. However, the spending authorities voted by Parliament remain on an expenditure basis. This section highlights the significant items that contributed to the net decrease in resources available for the year, as well as actual expenditures for the quarter ended September 30. Chart 1 outlines the gross budgetary authorities, which represent the resources available for use for the year as of September 30. An increase of $10.1 million for two programs; Housing Statistics Framework (Canadian Housing Statistics Program) and Measurement of Growth in International Visitors to Canada. In addition to the appropriations allocated to the agency through the Main Estimates, Statistics Canada also has vote net authority within Vote 1, which entitles the agency to spend revenues collected from other federal government departments, agencies, and external clients to provide statistical services. 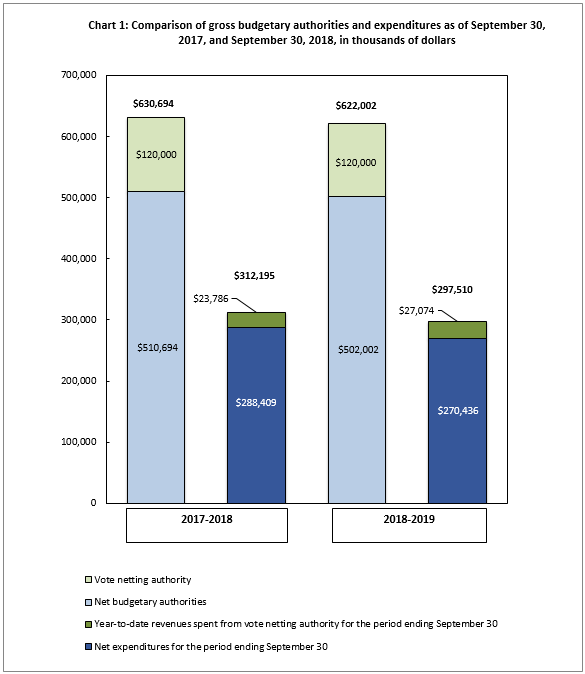 Vote netting authority is stable at $120 million in each of the fiscal years 2017-2018 and 2018-2019. Year-to-date net expenditures recorded to the end of the second quarter decreased by $18.0 million, or 6.2% from the previous year, from $288.4 million to $270.4 million (See Table A: Variation in Departmental Expenditures by Standard Object). Statistics Canada spent approximately 53.9% of its authorities by the end of the second quarter, compared with 56.5% in the same quarter of 2017-2018. The decrease is also explained by timing differences of payments at this period compared to last fiscal year. Table summary: This table displays the variance of departmental expenditures by standard object between fiscal 2017-2018 and 2018-2019. The variance is calculated for year to date expenditures as at the end of the second quarter. The row headers provide information by standard object. The column headers provide information in thousands of dollars and percentage variance for the year to date variation. Personnel: The decrease is mainly the result of the negotiated salary adjustments following the ratification of the collective agreements in 2017-2018. Professional and special services: The increase is mainly due to the hire of external resources, language training and other external training taken by employees. Rentals: The increase is mainly due to software licenses renewal and maintenance. Other subsidies and payments: The increase is mainly due to the non-salary payments related to the Statistical Survey Operations pay equity settlement. Revenues: The increase is primarily the result of timing differences in the receipt of funds for scheduled key deliverables. Statistics Canada is currently expending significant effort in modernizing its business processes and tools, in order to maintain its relevance and maximize the value it provides to Canadians. As a foundation piece for some of these efforts, the agency is working in collaboration with Shared Services Canada and Treasury Board of Canada Secretariat (Office of the Chief Information Officer) to ensure the agency has access to adequate IT services and support to attain its modernization objectives. Activities and related costs are projected based on various assumptions that can change, depending on the nature and degree of work required to accomplish the initiatives. Risks and uncertainties are being mitigated by the agency's strong financial planning management practices and business architecture. The Census program is ramping down operations from the 2016 Census and is in the planning phase for the 2021 Census. As such, expenditures for this program are significantly lower than other years within the 2016 cycle. Budget 2018 announced funding for new initiatives. Expenditures related to these new initiatives have begun to ramp up and are expected to continue to do so throughout the fiscal year. Table summary: This table displays the departmental authorities for the fiscal year 2018-2019. The row headers provide information by type of authority, Vote 105 – Net operating expenditures, Statutory authority and Total Budgetary authorities. The column headers provide information in thousands of dollars for Total available for use for the year ending March 31; used during the quarter ended September 30; and year to date used at quarter-end for 2018-2019. Table summary: This table displays the departmental authorities for the fiscal year 2017-2018. The row headers provide information by type of authority, Vote 105 – Net operating expenditures, Statutory authority and Total Budgetary authorities. The column headers provide information in thousands of dollars for Total available for use for the year ending March 31; Used during the quarter ended September 30; and year to date used at quarter-end for 2017-2018. Table summary: This table displays the departmental expenditures by standard object for the fiscal year 2018-2019. The row headers provide information by standard object for expenditures and revenues. The column headers provide information in thousands of dollars for planned expenditures for the year ending March 31; expended during the quarter ended September 30; and year to date used at quarter-end 2018-2019. Table summary: This table displays the departmental expenditures by standard object for the fiscal year 2017-2018. The row headers provide information by standard object for expenditures and revenues. The column headers provide information in thousands of dollars for planned expenditures for the year ending March 31; expended during the quarter ended September 30; and year to date used at quarter-end 2017-2018.